@WickedStyx, the amount of mental abuse we ask them to go through is staggering. @Dexios S Divine, and in politics. @Tristannnn, oh quite the contrary, Tristan. @WickedStyx, instead of just blessing them, how about we pay them what they are due? @WickedStyx, You are welcome good sir. @Bender B, police misconduct is an issue down in the States. Up here in Canada it's a lot better. Not to say we don't have bad eggs, but our hiring procedures root out a lot of them right off the bat. The others are usually rooted out within their first 5 years. It also comes down to the people they're serving. If you don't show the police respect why should they reciprocate it? The police down their are under media attack as well as physical attack by those who don't respect law enforcement. Of course there's going to be misconduct if the police aren't sure if a noise complaint is a noise complaint or a gun fight. They go in and take charge and use excessive force because they're scared for their lives. And then some idiot records it and posts it on YouTube and the internet blows up and a cop gets shot somewhere reinforcing their paranoia. And then there's the dickhead cops. I don't need to speak about them.. lol Sorry for the novel. To protect and serve, not to harass and douche. Im not sure I understand... this post's. Grammar. @Mendicant Bias, It's tumblr. You have to shut down some of your brain to read it. 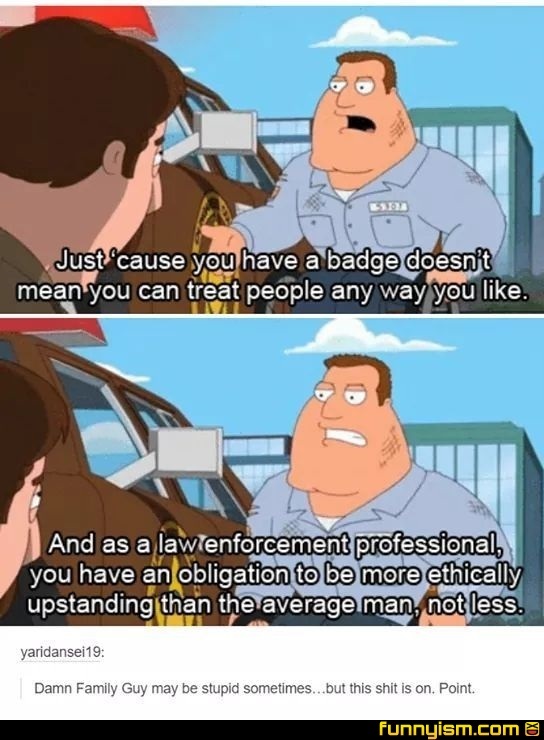 Or the average man can learn to be as ethically upstanding as they want their cops to be. But seriously, who talks like. That. They just made 2 sentances. Point is a sentance by itself. Based on the rules of the language, it doesn't make sense.